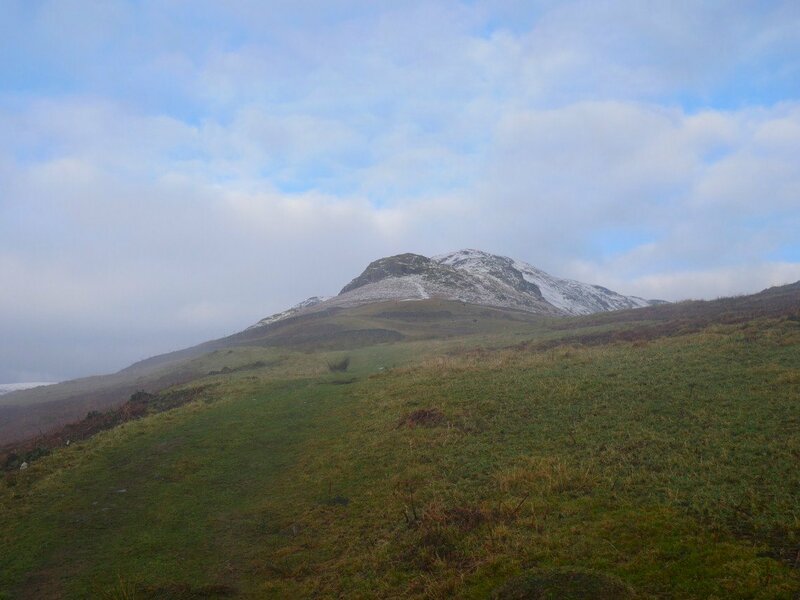 One of our ' a walk near a main road in case of snow ' walks this week. We weren't really sure what the weather would bring but we got lucky and enjoyed a fabulous day out. Helm Crag from the road to Helmside. After driving north through almost constant fog we were glad that as we reached Grasmere we could see that the tops were clear ( David joined us today ). 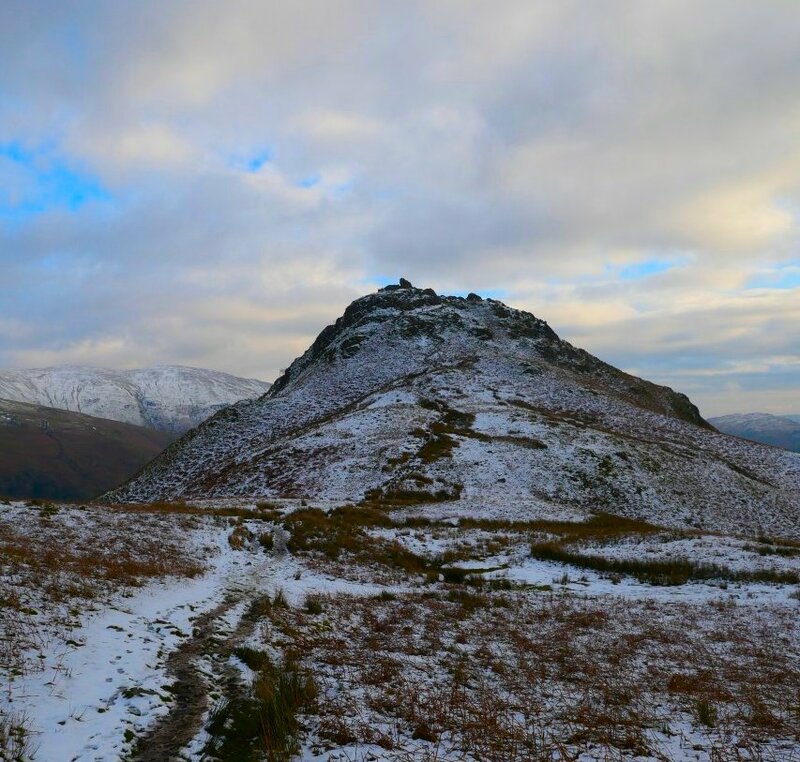 Helm Crag is the last stop for us today. Steel Fell is the first. Almost immediately as we began to climb we started to get the views. 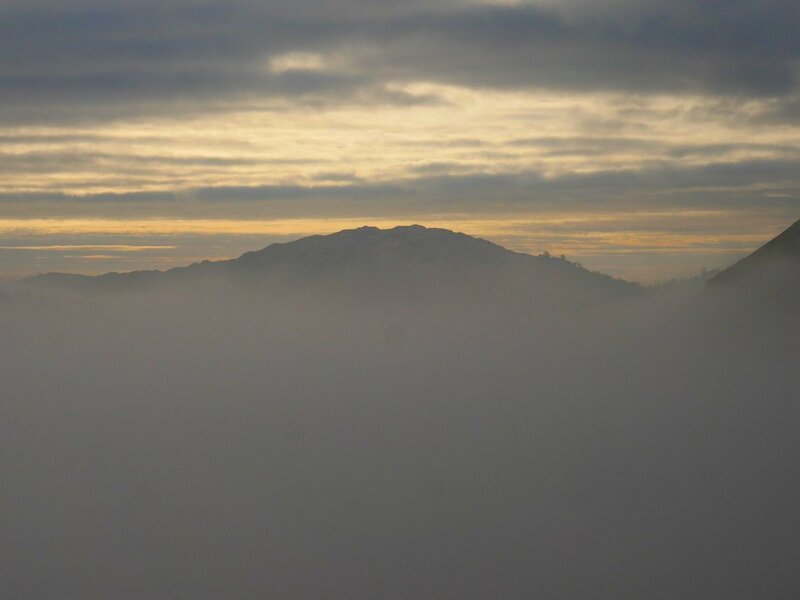 This is Loughrigg emerging from the cloud. 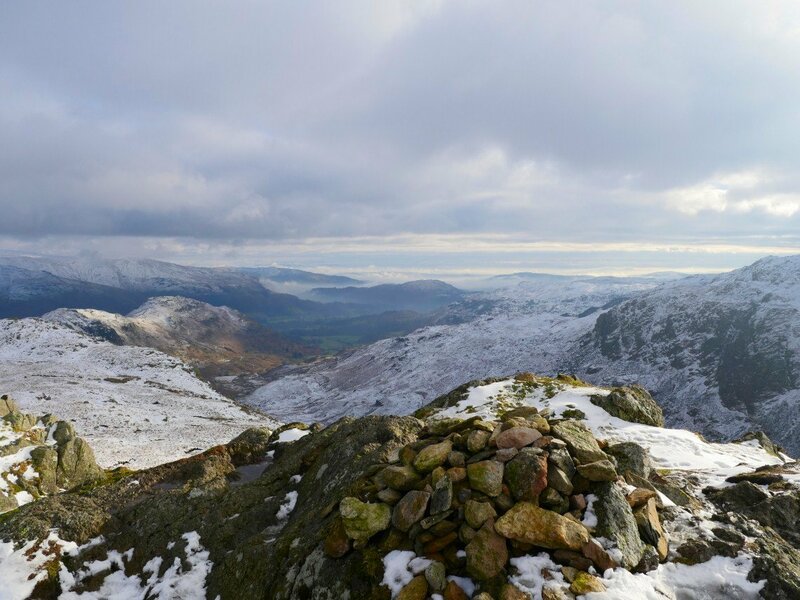 Loughrigg again above the inversion over Grasmere and Rydal. 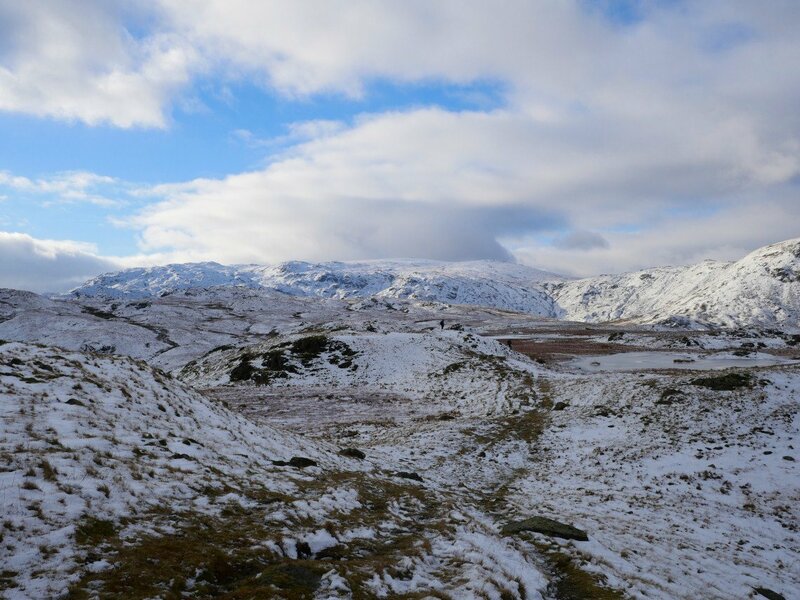 Looking over the A591 to Helvellyn. 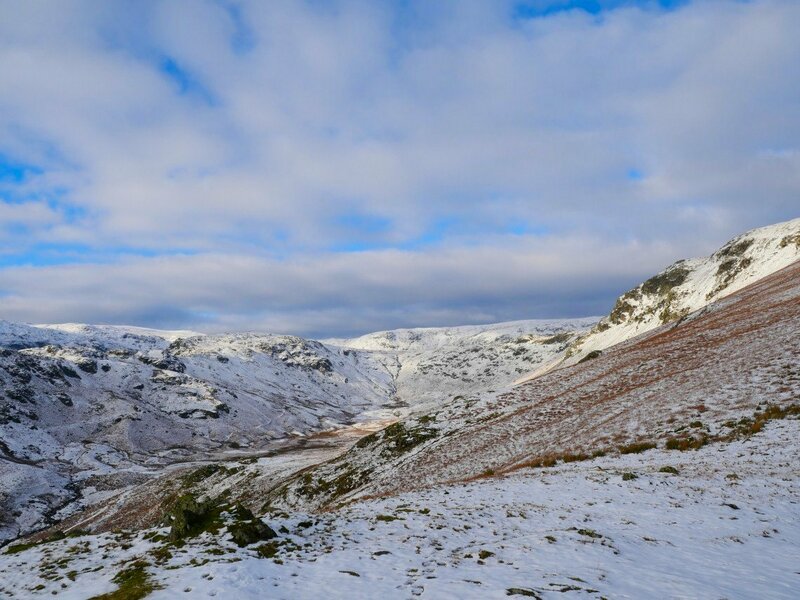 The head of the Greenburn valley takes the award for my first blue sky and snow picture of the 2018/19 winter. The mist is dissipating in the valley. 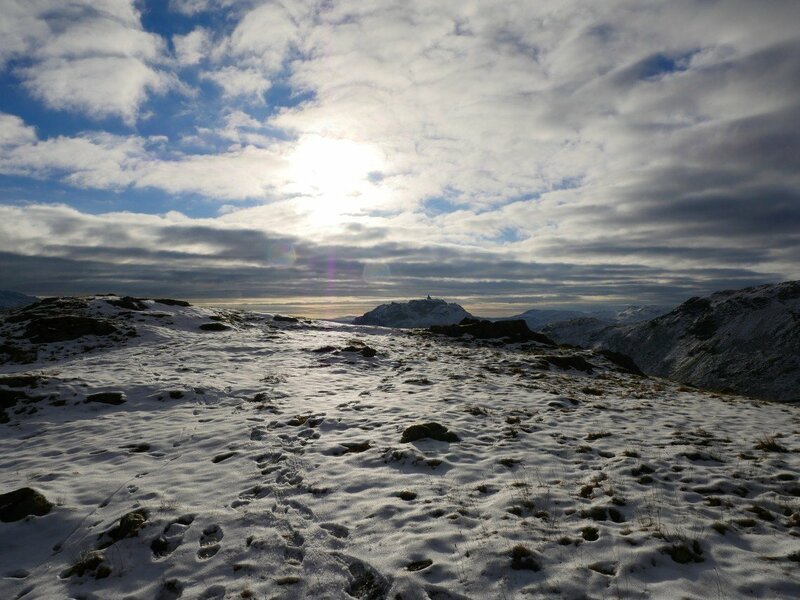 Looking to the Sun and Helm Crag from the summit of Steel Fell.. 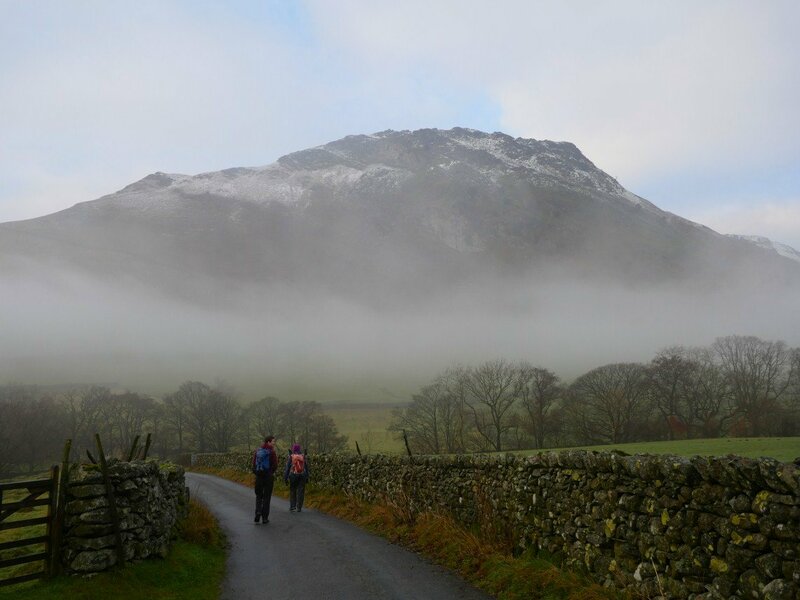 Zooming in over Helm Crag to the 'islands' in the mist. Higher level cloud has settled on Helvellyn. 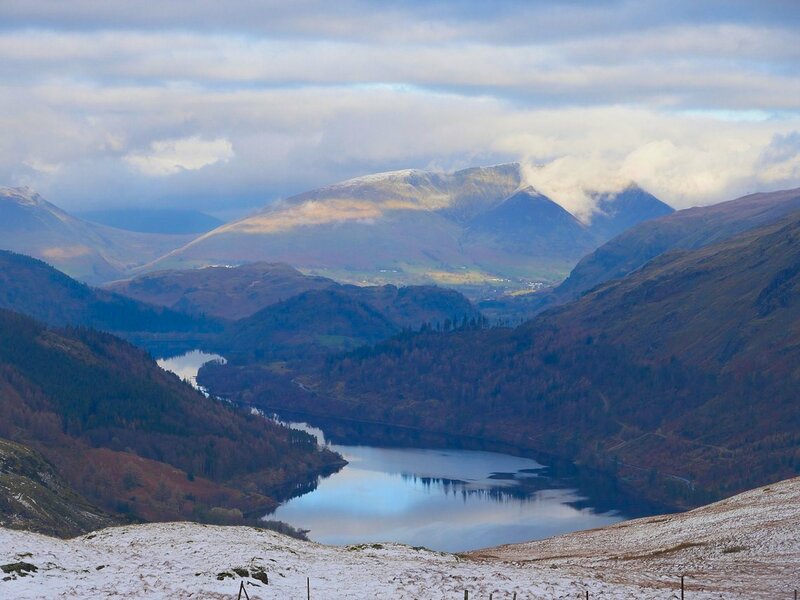 Looking north over Thirlmere to High Rigg and Blencathra. Our onward route, made easier by being frozen. Sue and David pass one of the tarns just next to the path. 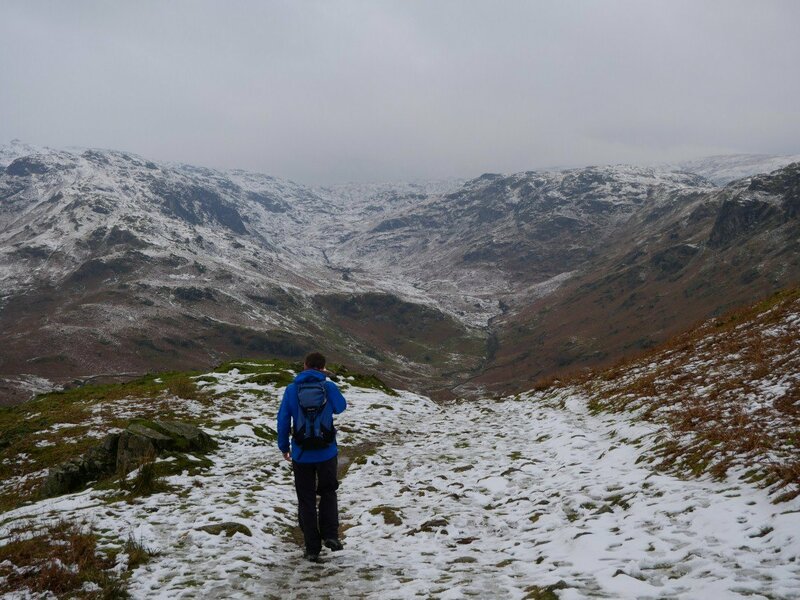 On to Calf Crag now looking along the ridge and to Grasmere. 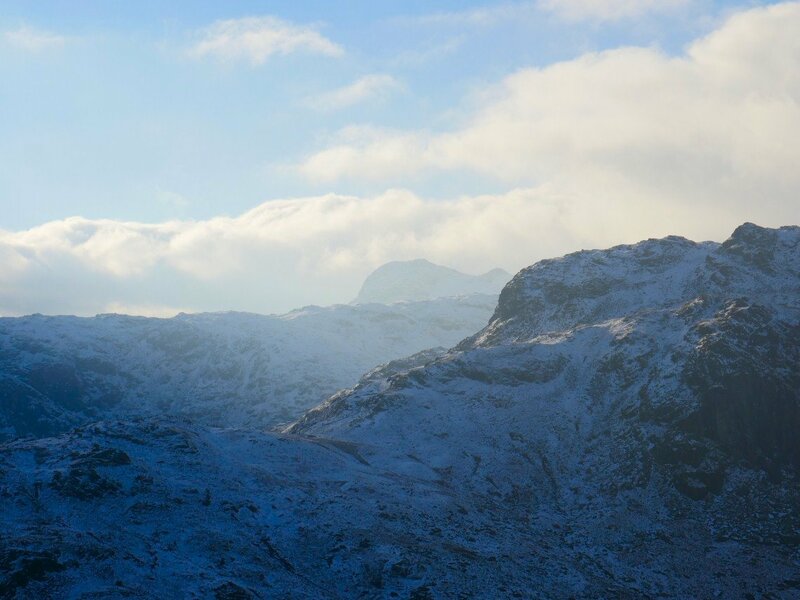 Harrison Stickle seen through the drifting cloud which moved over the fells all around us for most of the afternoon. 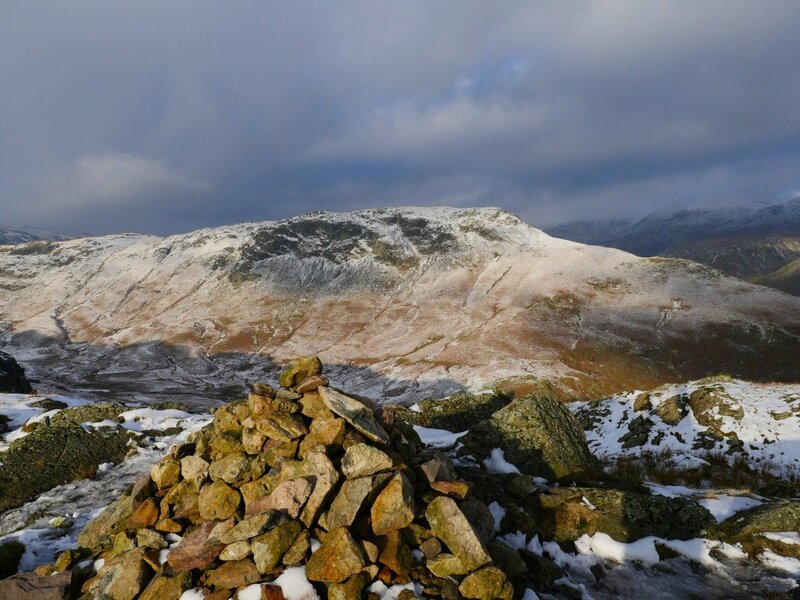 Looking over to Steel Fell from Gibson Knott. The sky to east and north has gone a bit dark. The sun is still shining over to the west though. 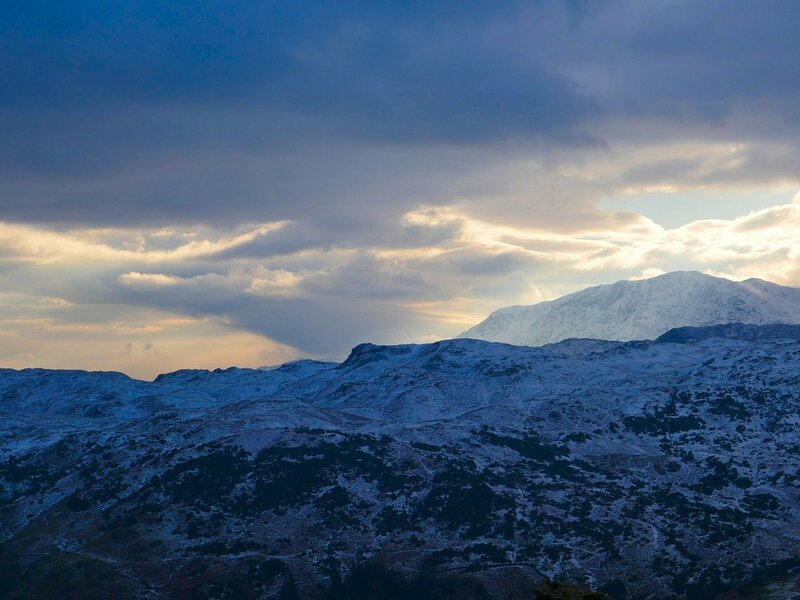 Lovely clouds over the Coniston fells. 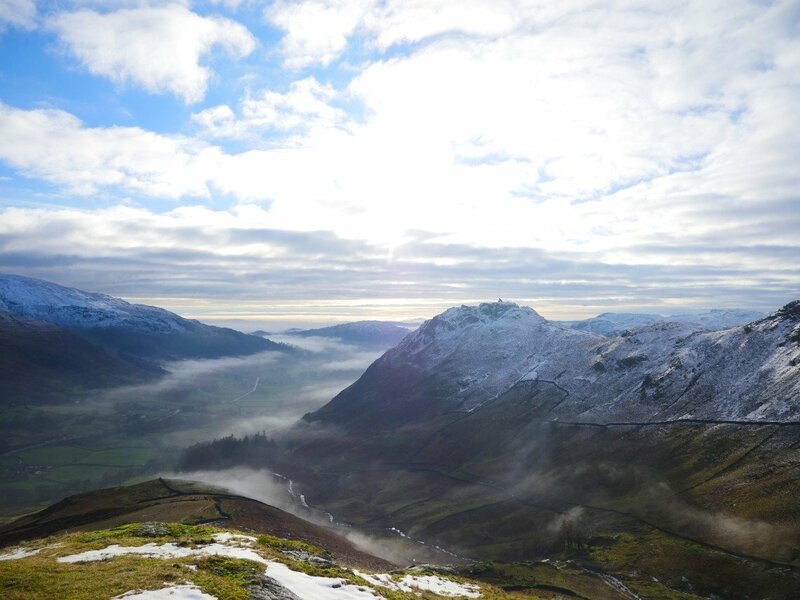 Helm Crag from Bracken Hause. 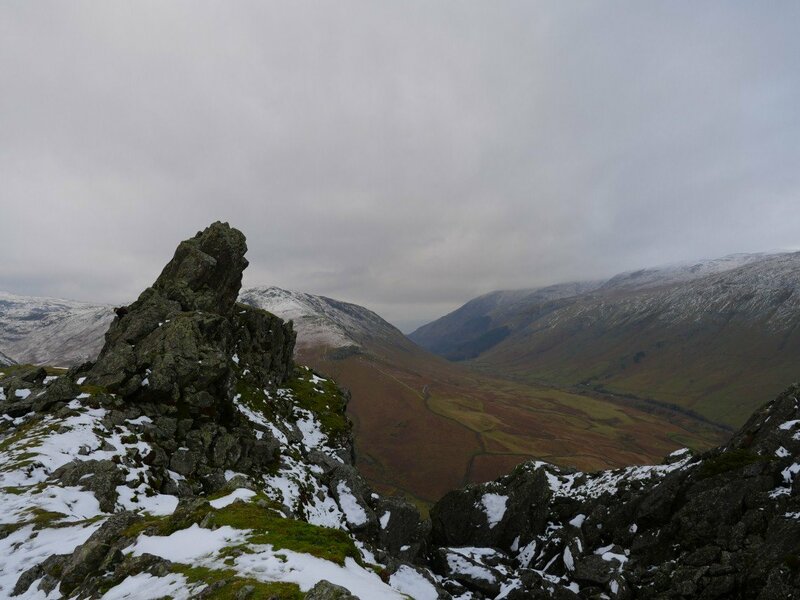 The Howitzer on Helm Crag. And at the other end of the fell, the Lion and the Lamb. Grasmere village and Grasmere the lake below. 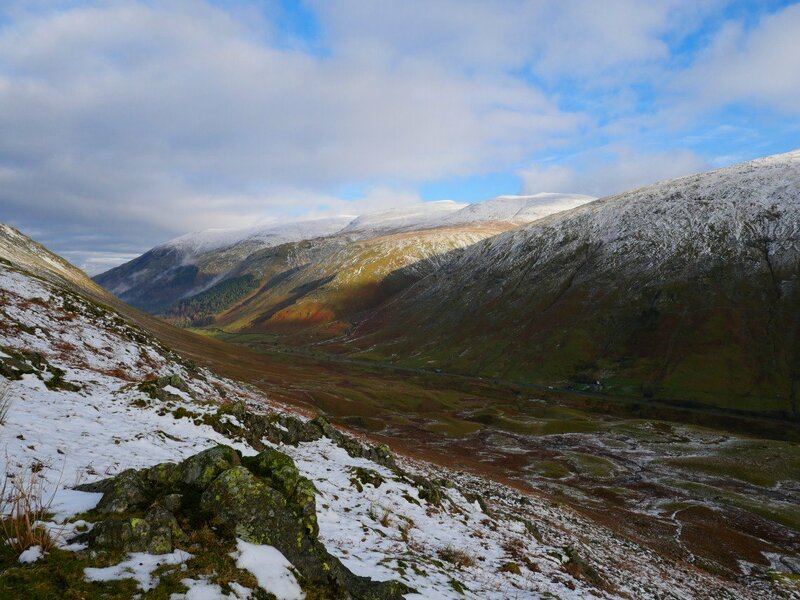 Looking along Far Easedale with the bad weather coming down from the north. 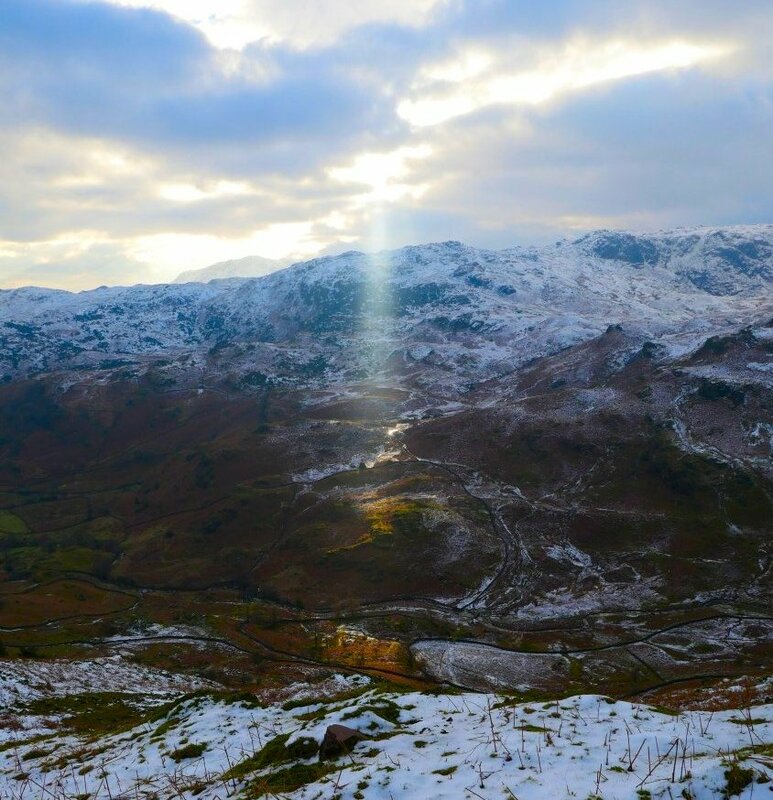 Beautiful photos, Karl - what magical conditions for a walk. 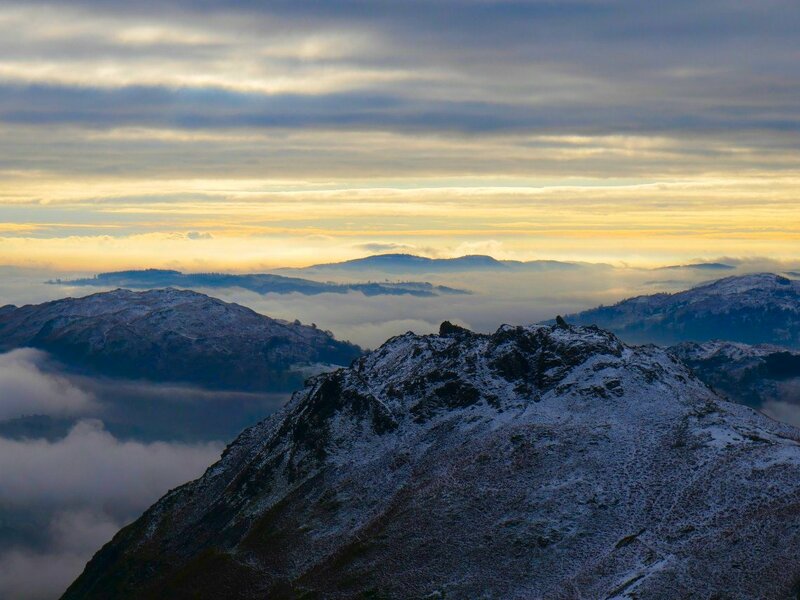 The telephoto shot of Blencathra's ridges wreathed in clouds is particularly fine. Makes me want to take up photography again. 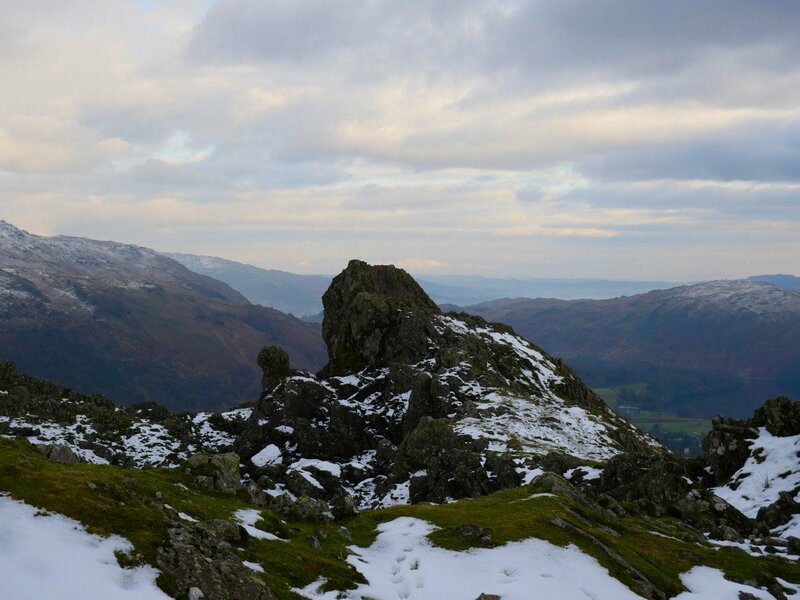 PS - Helm Crag was the first mountain that I climbed - well it certainly seemed like a mountain to a 7 year old! Wow Karl they are stunning photos. 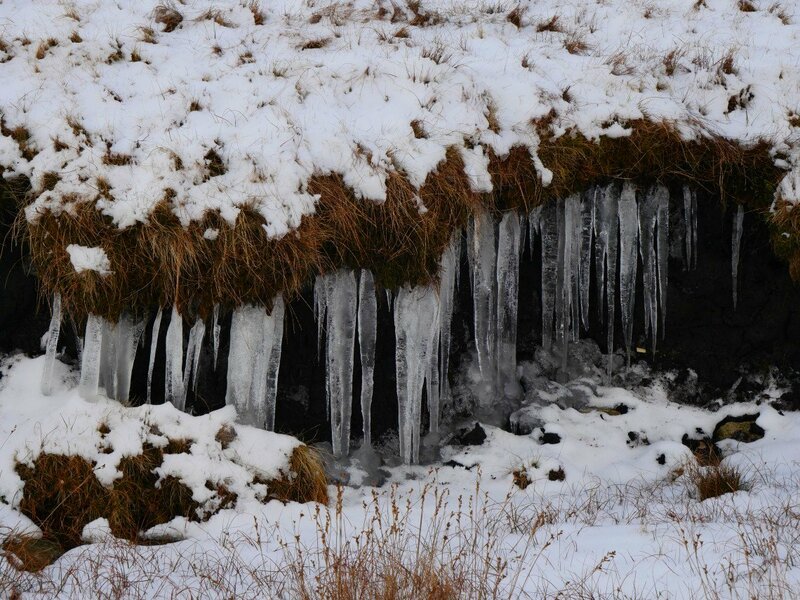 A frozen day is a good idea for the bog after Steel Fell. 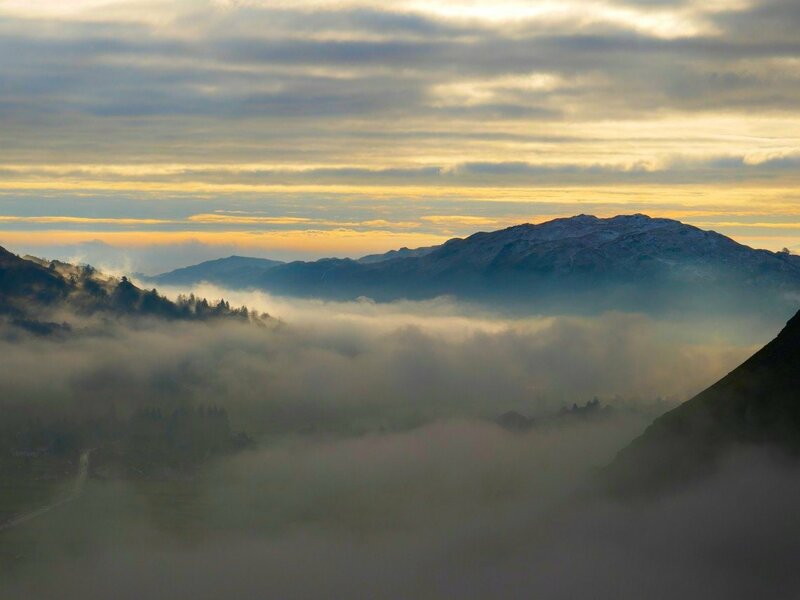 Wonderful pictures - hard to pick favourites but I love the inversion over Grasmere and Rydal and the islands in the mist - beautiful. I am so cross with myself for forgoing Sunday after seeing these and Photonut's pictures. 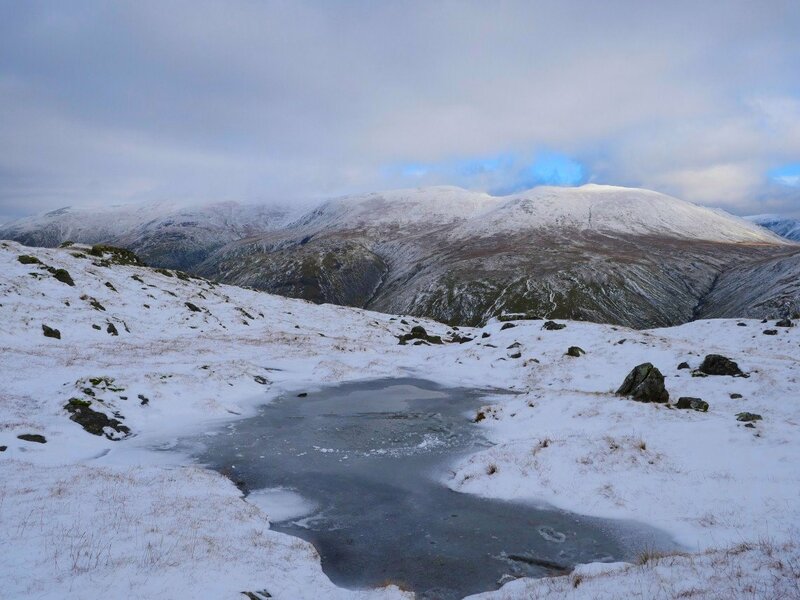 Great photos, they capture really well the changing conditions of the day on the first wintry landscape. 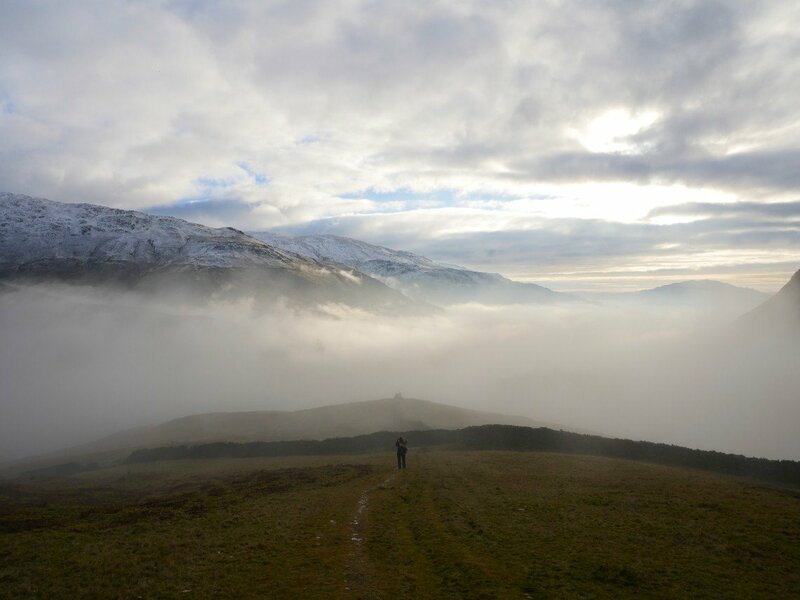 Splendid TR & stunning photos Karl, I especially like the 'view of Loughrigg and the inversion over Rydal & Grasmere'. But, they are all good. Although I presume you have exclusive rights under the Cut Price Tours operation ? I can only echo what's already been said - fantastic photos! 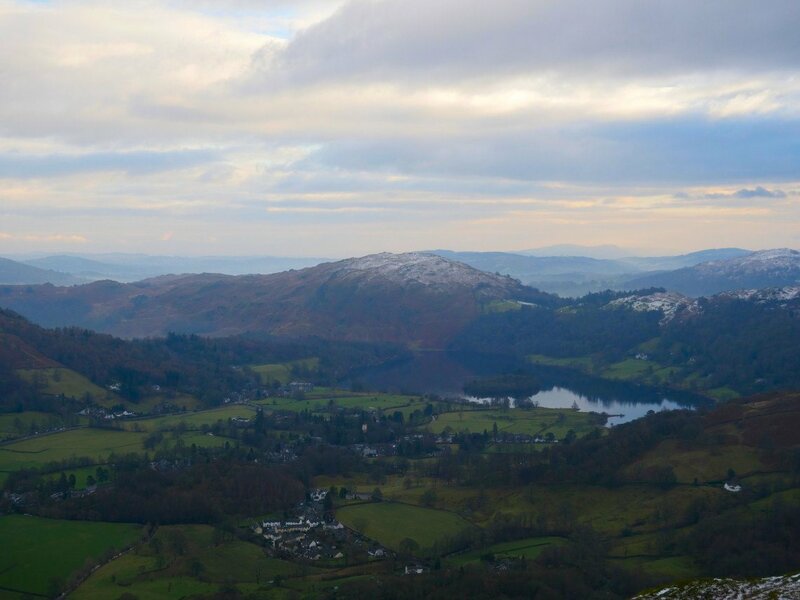 The colours in the one of Loughrigg above the Grasmere/Rydal inversion and the zoom-in over Helm Crag are breathtaking. That's a right old pull up Steel Fell... but most definitely worth it. 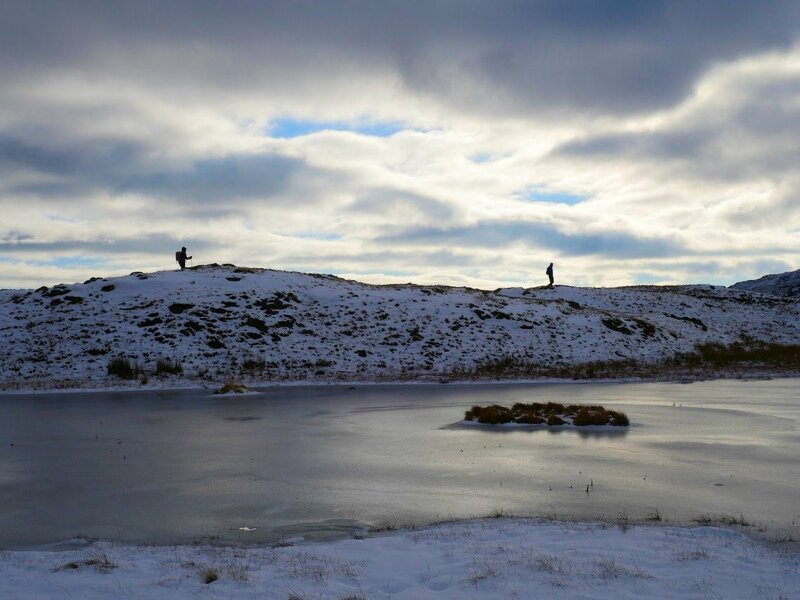 Even more so if the boggy expanse at the top of it is frozen!